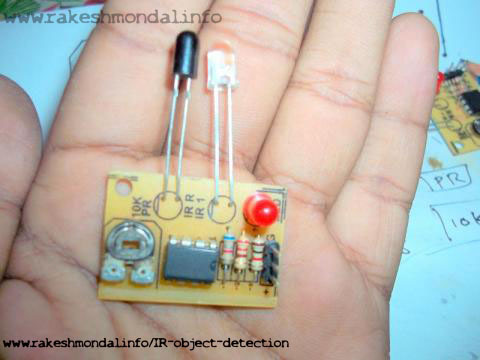 The IR Object Detection sensor module is quiet easy to make. 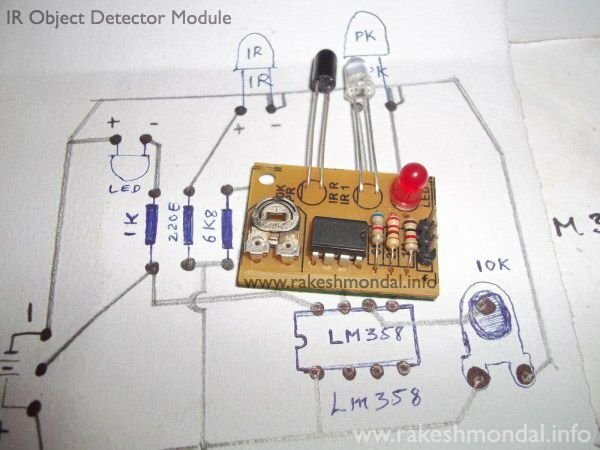 This sensor circuit below is a low cost – low range infrared object detection module that you can easily make at home using IR LED’s. We will use a photodiode and IR LED to make a simple circuit. IR led looks like a regular LED that you usually see in Television Remote controls.For now I have added a regular LED to glow as in indicator when something is detected, you can replace it with a buzzer or something else the way you wish. The Main concept is simple, the IR led keeps transmitting IR infrared rays up to some range (there is a potentiometer also in the design with the help of which you can alter the range). 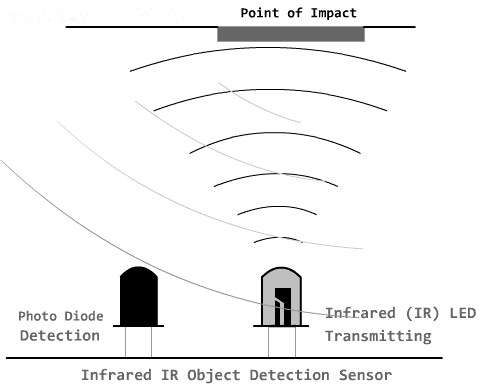 When some object comes in the (IR) infrared range, the IR waves hits the object and comes back at some angle, The Photo diode next to IR led detects that IR infrared rays which got reflected from the object and hence works as a proximity sensor. You can read more details about Proximity sensors for more. 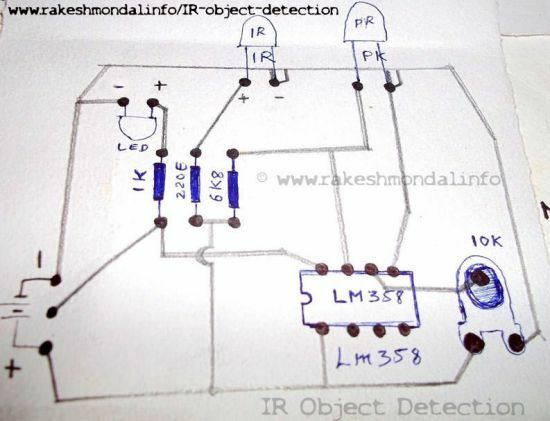 The components required to make this IR sensor can be easily found in any electronic stores and it is quiet inexpensive. 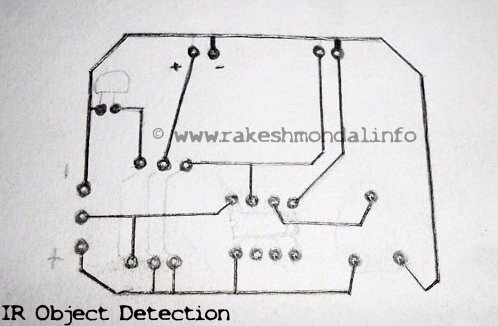 Following this schematic you can easily make it on a breadboard, I intentionally drew this schematic for this IR sensor this way so that it can easily printed on the copper board in no time if you have some etching solution. For now in this circuit an LED would glow as an example. Notice that there are three pins in the schematic in which two pins are used to provide power to the infrared sensor and the Middle pin is unused, and can be used for other operation. 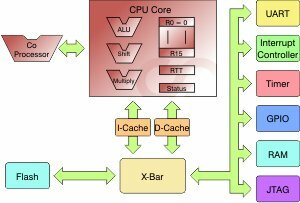 The Middle pin goes high (Logic 1) if the photodiode in this object detection module detects an object, and hence can be interfaced with other devices. You can use it the way you wish, it can be used to run some DC motors and make a simple robot. The middle pin of the IR Sensor Circuit can be interfaced with Microcontroller easily to do complex operations,or you can interface an LCD with microcontroller and have the status of the sensor displayed on the LCD very easily as in my next tutorial for interfacing multiple IR Sensors with Arduino and LCD.